Chi gets into more trouble, with both her human family and her new animal companions, than ever before in Chi's Sweet Home Volume 6. Chi's Sweet Home Volume 6 is, of course, the sequel to Chi's Sweet Home Volume 5. The review of Chi's Sweet Home Volume 1 is here and the review of Chi's Sweet Home Volume 5 is here. Otherwise, read on! When you pick up a Batman comic, there is a certain cast of characters you expect to see. He has is traditional line-up of supervillains, such as Joker, Riddler and Two-Face. And he has the people he generally calls for help, like Zatarra and Black Canary. But that doesn't mean no one else ever visits Gotham City, or that Batman never travels himself, either. 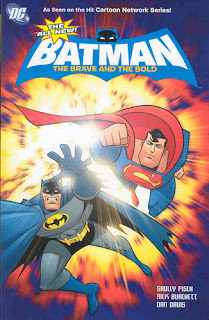 Welcome to The All New Batman: The Brave and The Bold Volume 1. Based on the Cartoon Network cartoon series, The Brave and The Bold has Batman team up with some of the heroes we don't see so often, and fight villains who might not be in the same league as Darkseid. Collecting issues #1-6 of the comic book series, Batman mainly teams up with other heroes we're quite familiar with, but the stories aren't like ones we would generally see in one of Batman's normal comics. In 'That Holiday Feeling', it's Christmastime in Gotham. Billy Batson has taken the bus into town with Mister Tawny, but as they step off the bus they see chaos that isn't the usual last-minute shopping bustle. Psycho-Pirate is broadcasting on all channels, and he's spreading the less cheer-y emotions like despair and greed. Will Billy and his friends be able to get Batman out of his sulk and save Christmas? While brooding might be in Batman's nature, marriage certainly isn't. That's the side of Batman we see, along with Wonder Woman, in 'The Bride and the Bold'. Eros is disgusted that Diana, instead of spreading love on Earth, has been fighting. So he sends a few love arrows down to Earth and now our heroes are planning their wedding. Will they find out where their new-found love really came from before they reach the altar, and what kind of party crashers might show up on the big day? The heroes that Batman teams up here are generally better-known Justice League members, but the variety comes out in the choice of supervillains they face. Rarely do Gentleman Ghost or Mouse Man get much print time, but here they get their time in the spotlight once more. Manga Monday: At what point do people stop betrothing their children to random people, anyways? From fighting sharks to martial arts tea ceremony, battles run the gamut in Ranma 1/2 Volume 5. 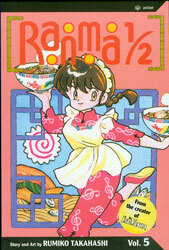 Note: Ranma 1/2 Volume 5 is, of course, the sequel to Ranma 1/2 Volume 4. The review for Ranma 1/2 Volume 1 is here, and the review for Ranman1/2 Volume 4 is here. Otherwise, read on! Japan has had to be a very structured society for centuries. A relatively small country with very little in the way of natural resources (even with the abundance of fishing, over 60% of the food used by the country is produced elsewhere), the will of the self has by necessity had to take a back seat to the will of the collective. This attitude continues today, with the stereotypical 'salaryman' position being a prime example. But what happens when, for whatever reason, a person simply can't make himself fit into that mold? Some people simply fall out of society altogether, and that is what happened to our narrator, who goes by Oyamo Shiro, in A Man With No Talents. He is very careful to lay the blame for not fitting on his own shoulders, and not blaming society or his parents. Rather, he sees himself as simply unable to cope with the stress of a normal job and life in modern Japan, so he gave up on that part of life. Instead, he works as a day laborer on the streets. He started this life fairly late, at around 40 years of age. He did try his best to keep up the appearances of a normal life. he went to university and was able to get decent jobs. But without fail, eventually he would 'get sick' and not be able to keep going to work. Later on he reads up a bit on psychology and decides that he might have something of a mental illness rather than being simply weak-willed, but eventually he gives up on mainstream jobs, gives up on his former life, and takes up residence at a bunkhouse in the San'ya district of Tokyo. Here, he falls in with the day laborer crowd, and begins to take jobs with them. Officially unemployed, he has a card that, when he works a certain number of days for the month, he can turn in to a government office for a stipend for the days that he doesn't work. This gives him enough money to get by, living in a doya, or bunkhouse. He shares a room with six other men, receiving a bunk bed with a curtain around it to sleep in, a TV with a headphone jack at the foot of the mattress, and a locker in which to store his belongings. While this would seem spartan at best to most, he sees this existence as freeing, allowing him to live without the responsibilities of a normal job and apartment that had made his life so unbearable before. The book is a really interesting look at one of the subcultures of Japan that many never see. the outskirts of Toyko has is boxtowns and its truly homeless who sleep on the streets, but rather than rail against the uncaring government, our narrator is grateful to live in a country in which he is able to choose a path in life that he finds more suitable. He chose a good time in Japan's recent history to become a day laborer. At the beginning, during the housing boom, laborers like him could be choosy, only picking the types of jobs that they preferred, or even taking a day off, confident in the fact that there would be work waiting for him the next day. After the bubble economy collapsed, however, work became more and more scarce. Men would line up at two in the morning outside the job offices that open at six, and even this would guarantee a job for the day. Besides this, our narrator is getting older, and even though he has always gravitated towards the easier jobs, even these get harder and harder as one ages, and not everyone is able to keep up the work until he reaches the official retirement age. The author submitted his memoir to a writing contest on a whim, and was stunned when it won. Shunning the spotlight, he refused to accept interviews after he won, preferring to continue the life he had chosen for himself. Manga Monday: Who knew a university of future superheroes would have so much drama? In a world where super heroes are a fact of life, it would make sense that there would be institutions to teach them the best uses for their powers. And depending on the levels of young person’s powers, there would by necessity be universities of differing prestige. 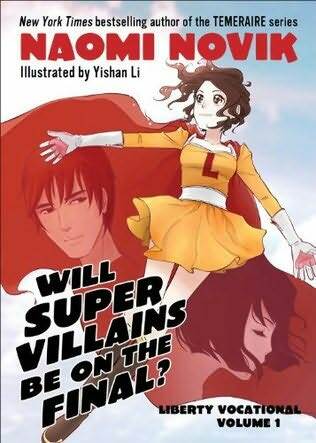 Welcome to Liberty Vocational, seen here in Liberty Vocational Volume 1: Will Supervillains Be On The Final? This is the Ivy League of Superhero Universities. And being accepted at 16, Leah Taymore is a prodigy. Well, her powers are, at least. Leah, being younger than most anyone else on campus, is terribly awkward and a step behind from the moment she steps foot on campus. Granted, having co-ed dorms makes sense, when so many superheroes end up on teams and have to get used to the idea of sharing bunks and changing together eventually. It’s a little hard for Leah to wrap her head around at first. Having grown up with very low level parents, she is hardly prepared for the reality of a campus full of powerful superheroes-in-training, but she is ready to do her best. We meet a few people during her first days on campus. There is her roommate Yuzana Myat, a Bermese empath who tends to “listen in” on her classmates, but genuinely likes Leah, and helps her out. In her chaotic first day, she also has time to find a male classmate named Paul Lyman to start crushing on. Which, admittedly, is probably to be expected of a 16 year old girl. We get to see a few of her classes, which run the gamut from ethics to costume design, and meet a rather terrifying dean. But not all drama is confined to campus. When rains start to send the nearby river out of its banks & Leah is the only one on hand to stop it, will she risk being expelled to save the town? And why does it seem like everything Leah does somehow gets undermined? Liberty Vocational Volume 1 throws a whole lot of plot into under 200 pages of comic. 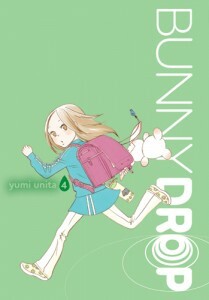 Having never been serialized, it has a different flow than most manga, but plenty of plots are established to let the series go for quite a long time. Why would Lady Maccon let an impending infant slow her down? Alexia is back in full force, with her retinue of vampires, werewolves and treacle tarts in Parasol Protectorate 4, Heartless. 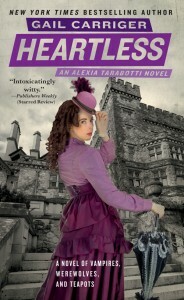 Note: Heartless, is the fourth book in the Parasol Protectorate series. The review of the first book, Soulless, is here; and the review for the third book, Blameless, is here. Otherwise, read on!